“Add that much needed remote temperature sensor wherever you want, no wall outlet required. I recently needed to add a remote temperature sensor to my Minimalist Thermostat and I decided to make it with a Bluz Development Kit (Bluz DK from now on). 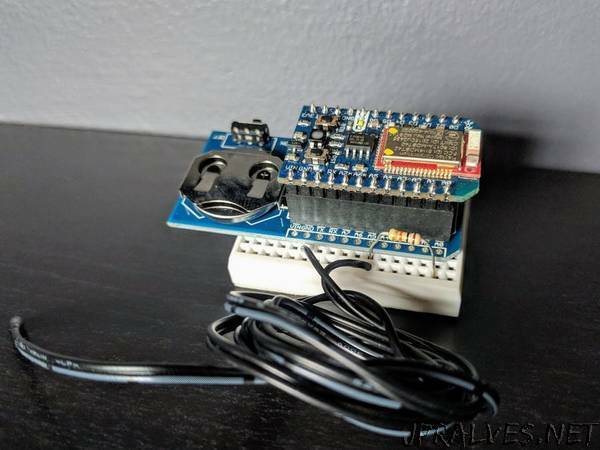 We are going to build a low power, BLE (Bluetooth Low Energy) remote temperature sensor connected to the internet so we can access its reading from anywhere. Bluz is a development kit that acts like an Arduino, but has Bluetooth Low Energy (BLE) communication built-in. With this BLE connection, the device can talk to the Particle cloud, a service that allows you to access your hardware anywhere in the world through a REST API. You can call functions, get variables, publish or subscribe to events, trigger webhooks, and even program it over the air through a Web IDE. Bluz is perfect for wireless applications that require long battery life. Because it uses BLE, bluz can last for months or years on a coin cell battery, all while staying connected to the cloud and fully accessible.